This easy Spicy Beef Noodle Soup recipe will satiate your cravings for a flavorful soup without having to spend hours cooking. Certainly, if you have the time, there’s no substitute for making soup stock from scratch. With our busy lives today, often we just need to prepare a quick meal to feed our hungry family and friends. 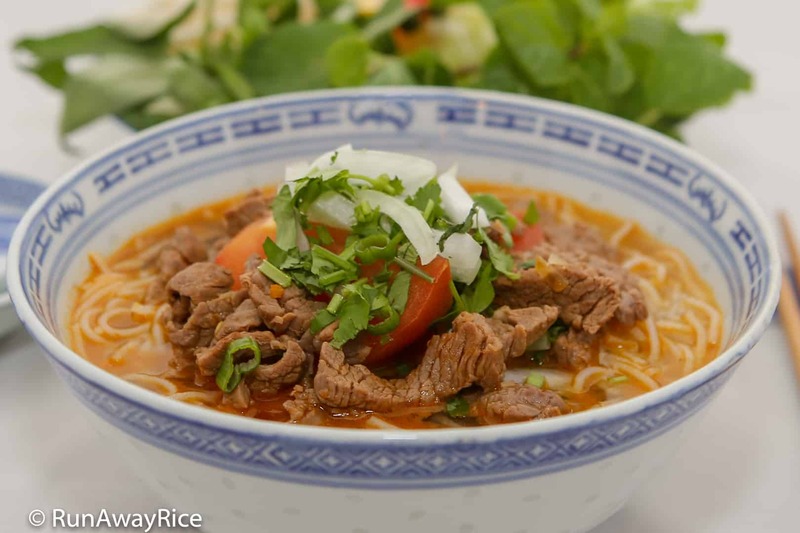 I hope you give this simple Spicy Beef Noodle Soup recipe a try and share your comments with me. Shrimp paste is often added to this Spicy Beef Noodle Soup but the paste makes the broth quite salty. If not serving this Spicy Beef Noodle Soup with shrimp paste, you may want to add salt or more fish sauce to the broth. At my house, we add fish sauce to our bowls individually, depending on one’s preference, rather than salting the entire soup pot. Cut off a 6-inch section of lemongrass and set aside for now. Mince the remaining lemongrass by hand or using a food processor. Chop the tops of green scallions. Cut the onion into thin slices. Coarsely chop the cilantro. Combine the scallions, onions and cilantro together and set aside in a small bowl. Dice the shallot and set aside in small bowl. Cut the tomatoes into wedges, approximately 8 wedges per tomato. Set aside on a plate. Cut the beef into thin strips and place in a medium bowl. To marinate, add ground black pepper, 1 tsp minced garlic, 1/3 Tbsp olive oil, 1 Tbsp minced lemongrass, 1 Tbsp diced shallots, 1 Tbsp fish sauce and mix well. Allow to marinate while continuing to next steps. In a medium saucepan, add the broth and water. Add the lemongrass section to the broth. Add the remaining 2 Tbsp fish sauce. Cover and allow the broth to slowly come to a boil over Medium heat. Heat a wok over High heat and add 1 Tbsp olive oil. Add the remaining 1 Tbsp diced shallots and stir fry quickly for 5 seconds. Add the remaining 1 tsp minced garlic and 1 Tbsp minced lemongrass and stir fry for 5 seconds. Add the mixed chili seasoning and stir fry for another 10-15 seconds. Transfer this seasoning mix into a small bowl and set aside. Heat the same wok over High heat and add the remaining 1 Tbsp olive oil. Add the marinated beef and stir fry quickly for a 2-3 minutes and remove from heat. The meat should still be pink. To the just boiling broth, add the tomato wedges and cook for 3-4 minutes or until they start to soften. Add the stir-fried beef. Stir in the seasoning mix. Cook for another 2-3 minutes. Ladle the hot soup over the cooked rice vermicelli. Garnish with the onion and cilantro mix prepared earlier. Serve with fresh herbs, bean sprouts, and red chilies. Optionally serve with shrimp paste. Enjoy! Hi! Just curious; wouldn’t using beef broth instead of the chicken make more sense? It does! Funny thing is I’ve always used chicken broth for this shortcut recipe. I find most canned beef broths to be a bit too strong. Please feel free to use beef broth if you like it. Good Luck!